HOUSTON (AP) With James Harden in the locker room with a hamstring injury and the Houston Rockets desperate to end their losing streak, Chris Paul came to the rescue. Paul gave Houston its first lead since the second quarter with a 3-pointer that made it 127-125 with 2:40 remaining in the first overtime. The Lakers got two free throws from Brandon Ingram, and Josh Hart added a basket on a goaltending call to make it 131-129 with about a minute to go in the first OT. Black tied it up before Hart missed a 3-pointer to give Houston the ball back. Paul put Houston on top with a short jumper with four seconds remaining, but P.J. Tucker fouled Ingram and he made both free throws with 0.8 seconds left in the first overtime to tie it at 133-133. Kuzma followed with a missed 3-pointer, and the Lakers got the ball back with 0.7 seconds left, but they didn’t have time to get a shot off. 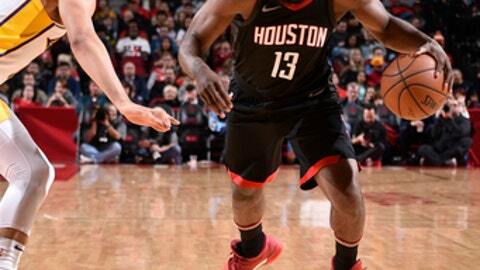 Houston center Clint Capela had seven points and seven rebounds in his return after missing two games with an orbital fracture. He wore a mask in the first half to protect the injured area, but it seemed to be bothering him and he took it off at halftime. Lakers: Rookie Lonzo Ball missed his fourth straight game because of a sprained left shoulder. He did not make the trip, remaining in California for treatment. … The Lakers’ 72 first-half points were a season high. … Ennis had a season-high 20 points. Rockets: Capela, who is also dealing with a bruised heel, missed four of the previous five games. … Gordon finished with 14 points. Harden has a strained left hamstring and had a noticeable limp after the game, but he hopes he won’t have to miss any time. Sunday was Houston’s first overtime game this season, and the Rockets have won six straight in double overtime dating to 2008. Five of those have been played at home. Lakers: Visit Minnesota on Monday. Rockets: Visit the Magic on Wednesday.